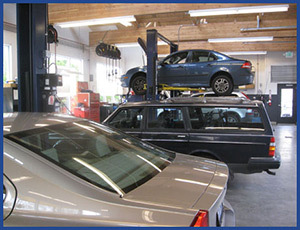 It is important that you trust the technician and the shop that is servicing your car. If you have a Volvo, Saab, Subaru or Mini Cooper that needs routine maintenance or a repair, and your car is not under a dealer warranty*, you can feel confident that we are an excellent alternative to the dealer. We utilize all of the factory diagnostic equipment for every line we service and are one of the only independent repair shops equipped with VIDA, the on-line Volvo diagnostic equipment required to properly service ’99 and newer Volvos. As a small, independent repair shop we are able to provide you and your car with personal attention and customer satisfaction is one of our highest priorities. *If you think your vehicle is under warranty, please let us know. We are happy to find out for you! We repair and maintain everything for your Volvo, Saab, Subaru or Mini Cooper except paint and upholstery, and we can refer you to competent shops that perform these services.